Hydraulic support clamps are often required to hold everything in place in a hydraulic system. They are especially important for keeping hoses routed exactly where they belong, which can ensure that flow rates remain stable and can shield hoses from undue exposure to heat or abrasion. Parker hydraulic support clamps Indio CA are an excellent choice for all of your hydraulic clamp needs. When you buy clamps from Bernell Hydraulics, you know that you are getting strong, factory-certified clamps because we are an authorized Parker parts distributor. 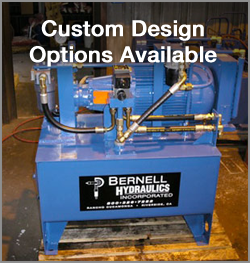 We can also help you install your clamps, even if you have a custom hydraulic system. Parker’s line of hydraulic clamps contains many features designed to deliver optimum performance. This should be no surprise seeing that Parker has a long history of innovation and expertise in hydraulic parts design. Hydraulic clamps may seem like a minor part, but in fact they can play a major role in keeping everything running smoothly. Parker’s tube clamps can come with webs inside the clamp to help with vibration and shock reduction. Special surface treatments and coatings to improve resistance to things like acid and rust are available on request. Parker hydraulic support clamps Indio CA can be purchased in a wide variety of sizes and materials, including polypropylene, polyamide, rubber, aluminum, and steel. Series A and B clamps feature zinc-coated screws, nuts, and plates, while Series C clamps feature uncoated steel.